Pulver-Eyes is a horrible monster. I mean yes, he looks like a horrible monster, but in the cartoon he is constantly eating rocks, which is tantamount to cannibalism. He looks like a monster and so he is a monster. Only he's a hero! (Apart from in Japan where he actually was released as a villain, because look at him!) Whilst his fellow Rock Lord look (mostly) human, Pulver-Eyes is very insectoid, with big bulging eyes and weird pincers and horns on his mouth. The face is the only part of him that really plays along with this depiction though, as the rest of him is pretty much humanoid, despite some strange proportions. It's good that Tonka took some risks with how these rock people would transform - it would be easy to have them all identical looking, but instead there's a lot of variation. Pulver-Eyes contains some interesting concepts that wouldn't be seen again. His arms are very flat, as they fold up on themselves for the transformation. A plus to this is that he has a good range of motion with them. Less effective is his gigantic birthing hips. The lower legs fold out of the thighs, which results in some well-articulated knees and feet, but upper legs that can't do anything except be huge. Due to the transformation (sliding out on a cylinder) they look like they should be able to move, but there's literally no clearance for them to do anything. If there's one thing that lets Pulver-Eyes down, it's his colour scheme. Or rather lack of one. 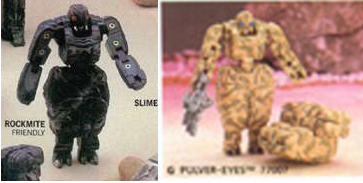 Whilst most other Rock Lords are two-tone with their secondary colour being revealed when they transform, Pulver-Eyes is a uniform shade of exactly the same flesh colour used on Boulder. He pulls it off slightly better than Boulder, but he's still a big flesh-coloured rock monster. There's a very slight variation (which we will come to in a later post) that looks a lot better due to a slight shade adjustment, though it's not one that captures well in photographs. The prototypes show that they had wrestled with the colour issue in the design stages. There's a version of him with a mottled 'meteorite-like design, and a black version (when he was called Rockmite), though apparently what we ended up with was deemed the best of these! Pulver-Eye's silver gun (called 'The Arrestor') helps to break up this colour somewhat. It's a nice chunky blaster that sits at right angles to his flat arms, and so helps to bulk them out somewhat. It's in his transformation that he really falls down. His arms and legs fold into themselves, and it's a good way to get a big humanoid mode into a small rock but there's very little clearance. You have to fold the waist and pull back the arms at a certain point, otherwise he jams up. The rock mode is also slightly lacking. It's nice that they tried to make an interesting shape, but it looks too much like a pair of legs with a pair of arms balanced on top. There's no illusion that it's one solid rock shape and that it isn't just Pulver-Eyes hiding and going "Tee hee" as he thinks about eating another baby rock. Pulver-Eyes might not be pretty, but he is unique. He's a horrible (heroic) monster, with a lot of interesting (weird) things about his design. He might not be particularly fun, but he's got a certain "Oh my god what the hell is that?" quality about him that is charming in its own right. Also his name is hilarious.